For many years at the start of every tasting, Rhône winemaker Denis Basset would give us small taste of his only white. “Just to set the palate,” he’d explain, before continuing on to his rich, syrah-based reds. The white was always lovely — floral and fresh, beautifully expressive, and a perfect way to start a tasting. And every year, when we asked how much we could buy, he’d smile and shake his head. (Loyal local restaurants were to blame). Two years ago, enfin, we were able to purchase some. It mostly disappeared through Futures, and since then we’ve been disappointing customers who have been asking for more. We’re excited to report that this year we planned a bit better, and reserved some in advance. It’s just arrived in the warehouse, and it’s as lovely as we remember. Denis Basset runs the Domaine Saint-Clair, which he started several years ago after spending the first decade of his working life in the family’s flower business. 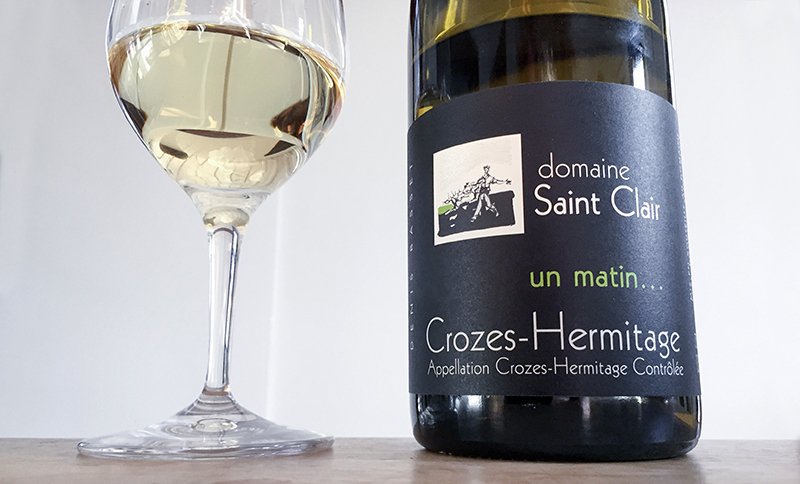 He has rapidly gained confidence and acclaim; both Decanter and the Guide Hachette have listed him in a dynamic new generation of Crozes-Hermitage winemakers. Basset’s white is a Rousanne-Marsanne blend (70/30), in the style of a classic northern Rhône. The nose is soft and enveloping, with tropical notes of mango, pineapple, and green tea. The mouth is rich and round, but well balanced, showing nectarine and honey notes. There’s so much exotic fruit in the nose you almost expect this to be sweet, but the mouth finishes cool and soft and dry. This is a perfect winter white wine, with bright citrus to match rich foods, but a cozy, mouthcoating softness that makes it hard to put down. Serve some with a salty triple cream cheese and crusty bread.